Most of the time we find some website with beautiful design and user friendly. And start finding what wordpress theme is used. it takes more time to find theme when a website owner remove developer link. have you ever wonder,what wordpress theme is that? i thought so. when we see others blog, it attract us from their website layout and we try to find that theme. 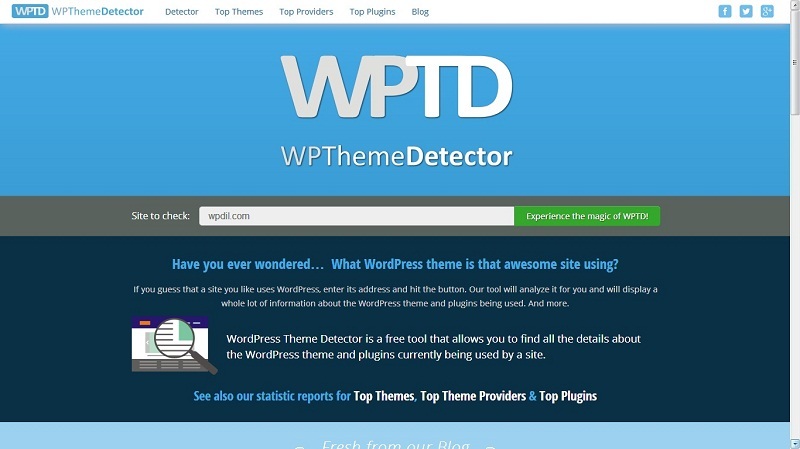 Now, finding a wordpress theme is now being easy with wpthemedetector within a second. WordPress Theme Detector is a free tool that allows you to find all the details about the WordPress theme and plugins currently being used by a site.it will show you which wordpress theme is used by particular website owner. Just put web url of any blog on wpthemedetector and then hit button. After some time it will show you detail about theme and plugin used by that website. WordPress theme detector provide following detail about website.